I travel alone. I like it. In fact love it. It’s my way to reconnect with myself while discovering those who are not ‘me’ in the land around me. I did think twice before saying yes to traveling in a group but figured one can always escape. Not only did I not need that escape chute, I thoroughly enjoyed and cherished the time spent with these newfound likeminded soles (catch the pun?). It’s sometimes not about where you go but how you go. Meeting different people is one of the reasons we all love traveling. The people you travel with sometimes are just as interesting, just as authentic. 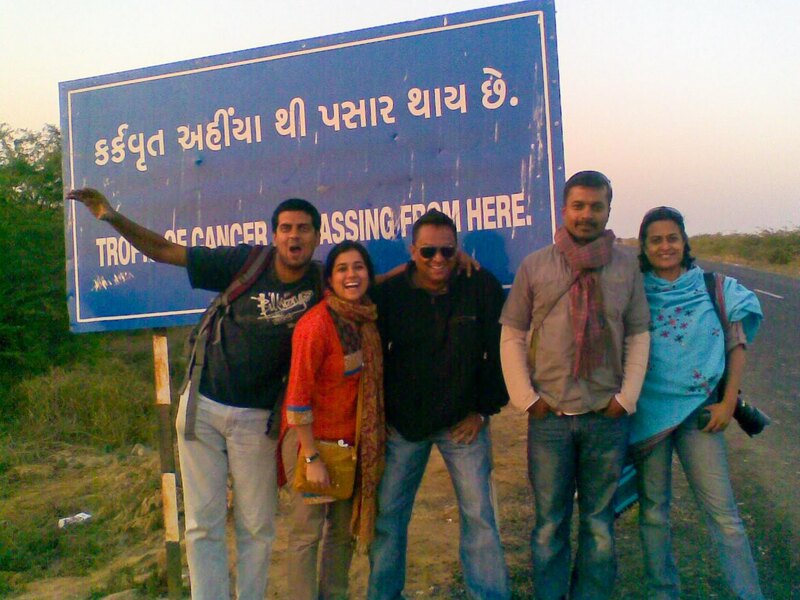 The magical moonlight on the Rann and the sunrise next day could not have been in a better company. Even with the millions (well sometimes more than 10 seems like million to me) around me, my companions shielded the noise, the chaos, allowing me to have that little moment where one wants to be the only one to behold a sight that can leave a poet wordless. And then when you have had your fill of the silence, you turn around stretch your hands to hold the full moon, take some cheesy photographs, taste the salt beneath your feet and just huddle together trying to hold off the nip in the air. With 'Z' I discovered a land that seemed unreal for those moments. Next day, ‘Z’ and I made our way to catch the sunrise. 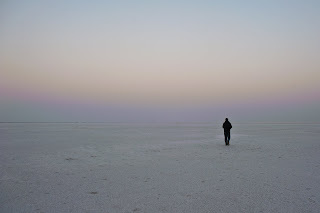 Our driver overslept, so we decided to walk at least a couple of miles to the Rann. The horizon, a mirage many a moments was still as a lake. The cold and distance played on my arthritic knees but ‘Z’ gently edged me on. I did not want to disappoint and kept up slowly giving us both space to enjoy the moments alone but together. Unlike the previous night, the land was enjoying its peace as well and so was I. We were the only ones around within miles. As we made our way into the villages surrounding the Rann, my thoughts seemed to be echoed in ‘Z’. As we walked ahead of the group, we encountered kids running towards us. We were not comfortable with little children holding their hand out for a pen or some money. Uncomfortable, we made some quick purchases for things I am sure we really did not need but wanted. ‘Z’ and I were very proud of our acquisitions. 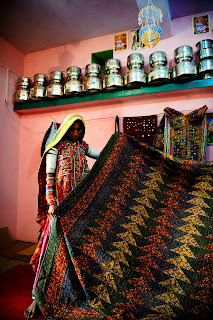 As we lay them in the room the colors of the Kutch reflected in those patchwork bed covers. Today, they adorn my urban space, remind me when I least expect a glimpse of the simple beautiful people who live surrounded by the vast plains. here, the land that absorbed the traveler, assimilated with the strangers making them their own. ‘Z’ has an infectious enthusiasm that rubs off on you, though a little loud at times but adorable nonetheless. As we meandered through the old fishing town, he found his passion. 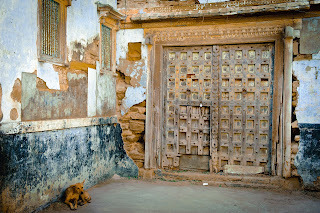 Now every cat in that town knows ‘Z’ and am sure the cats and their owners will remember us for the longest time to come. I did have a chance to wander about on my own, leaving ‘Z’ wandering on to the boats making conversations with Zanzibarian’s who had made Mandvi home. I heard a familiar sound of my mother tongue and there was Ramesh perched on a ledge, taking a break from hammering some cotton between the wooden planks. He said I looked like somebody from Hyderabad. That was uncanny but true and the commonality of language led the conversation further. Away from home for the last decade he said he worked on these mighty boats. A boy from the interiors of Andhra farmland, he was happy working on boats that sailed the trade winds to Africa. I still wonder how he knew that I was from Hyderabad, had ‘Z’ mentioned it? As we walked about in town buying some gifts for our host for the afternoon, ‘Z’ and I lost the others in the group. We knew our destination but not the path. But not to worry, seemed everybody in the town knew who we were and led us through the alleyways to our destination. While trying to navigate through town, randomly dropping into beautiful mansions one of which was a Jain dharamsala, which faintly had reminders of architecture from down south. 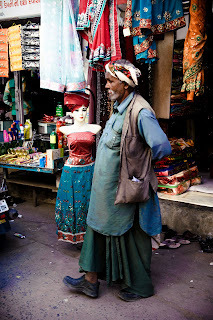 In the old market, I finally found someone who helped me buy this lovely vivid scarf that many of the Muslim men wore. I approached the colorful old man who insisted we stay in the background while he bargained for us. It turns out they the scarves come all the way from Karachi and one does not need imagination to know how it comes. ‘Z’ later learnt how to tie it around his head during a highway break. We seemed to have provided some much needed entertainment for the truckers. Mandvi had more in store for us. ‘Z’ was originally from Mandvi. 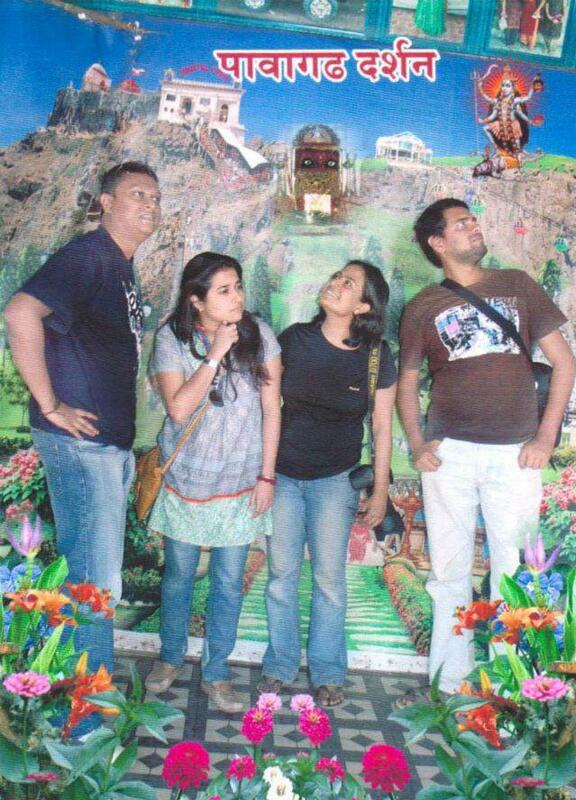 Family had moved to Mumbai in their grandfather’s time. Having tracked the current owners of the old ancestral home, ‘Z’ was invited and so were we by default to an afternoon meal. ‘Z’ perhaps was controlling her emotions as we all sat in the living room fringed by the original woodwork. Imagine discovering the house where your ancestors left traces, perhaps messages etched in the wood. We shared her connections and in that we will always be connected with her to the house. Her memories of discovery linked with us. A Bohri ‘dastar khanna’ awaited us. Laid in the room next to the family kitchen, we all sat on the floor trying very hard to fold those unexercised knees and muscles. Famished after traveling through predominantly vegetarian land, we devoured the fresh fish and prawns. If the catch were any fresher it would have walked off our plates! The fish marinated in local spices, pan fried just fell off the bones. There was my ever-favorite Pomfret that kept me busy for a while. The prawns were cooked to perfection in rice, moist and succulent with the perfect burani to complete it. ‘Z’ was in heaven. You could see in the silence, a satiated smile that a teleportation had taken place. All it took was some fish in the meal to bring that joyous silent laughter and shine in the eyes. A thief caught in the orchard. As ‘Z’ enjoyed, oblivious to all of us like cat with a fish, we exchanged stories. The family of five brothers all lived together; from farmers to lawyers between them they had covered all occupations. There were children everywhere all around the same age. What joy to grow up with cousins, who are your first friends? As we made our way to see the house which in another 9 years will be considered a heritage house, the women of the house sat down to eat. We carried the babies, keeping them busy as the mothers ate in peace. After a spent afternoon, we said our goodbyes to our newfound friends who will always be a part of the journey. In this new age, I know we will meet again, if not anything virtually exchange the changes in our lives. Through time perhaps our paths will cross again, their children grown and my shoes worn a bit more. The land as intriguing as it was provided a backdrop to my experience. It was my interactions with ‘Z’ that made the trip. What I will remember from this trip are these human interactions that I hope I can maintain for years to come. Traveling with ‘Z’ is a story of who traveled with me. It’s a collective of a person, their traits and my adventures with them. ‘Z’ is not just one person but a part of all my four travel companions and what they shared with me. My memories intertwined with people who started off being semi strangers and ended as friends. Lovely Blog. Straight from the gut. The flavours of Gujarat are to stay with you for a life time...... Can feel it in your scriptures. Beautifully written, Madhu - love the concept of Z. I love to travel alone myself and it is rare to find another of the breed!